Review: I love games like this. Simple classic-style graphics (though still flashy enough to not look cheap or outdated) and hyperactive gameplay that you can dive right into without having to invest countless hours of your life to. 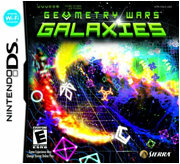 "Geometry Wars: Galaxies" is fantastic on the Nintendo DS and comes with a load o' extra goodies. For fans of "Geometry Wars: Retro Evolved", which was a big hit on Xbox Live Arcade (XBLA), you'll be happy to know that the entire game is included on the cartridge. Galaxies is also available on the Nintendo Wii and the two versions can connect to one another via Wi-Fi to unlock an extra galaxy to battle in. The gameplay itself is pretty simple: you play in a confined space (which differs depending on what level you're on) and you have to stay alive for as long as possible by killing the never ending swarm of enemies that float towards your ship like magnets. Whenever you kill enemies, they drop Geoms, which you can pick up and use to unlock new levels and/or buy drones. The drones serve a variety of purposes, but they'll all help you survive longer on each level the more you upgrade them. Some drones will defend you, some will go attack and some will hunt out Geoms so you can keep yourself occupied with the fun task of blasting enemies to smithereens. Of course, sometimes there are just too many damned enemies on the screen for you to handle, and that's when you can opt to drop one of your precious bombs to clear them all out in one quick blast. But use them sparingly, because the longer you last on a level, the more you'll wish you had those bombs at your disposal. All in all, Galaxies is a great continuation of the Geometry Wars series and I guarantee you'll become addicted to the frantic gameplay style whether you get the DS or the Wii version. If you're looking for a game that you can pick up and put down at the drop of a hat, rather than one that requires you to invest a few weeks of your life, I can't recommend this one enough. Geometry Wars also provides a variety of pretty colors. Sounds like a fun game, I will put it on the "to play list"
I loved the original Geometry Wars game on the Xbox (though I really sucked at it), and my DS is in serious need of usage. So, I'll probably be picking this up soon (and maybe the next Advance Wars). Plus, it seems like a seriously trippy game, and there's never anything wrong with those. Uugh "bright and pretty" games make me feel overwhelmed. I prefer normal colors, but anyway It is an ok game if you;re in a car. There's a demo of this on the 360 that's just screaming for a tab of acid.